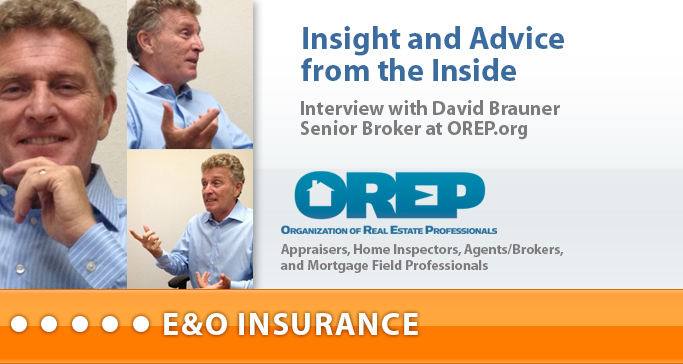 Editor’s Note: David Brauner is Senior Broker at David Brauner Insurance Services/OREP.org and Editor of Working RE Magazine. He has been providing E&O insurance to appraisers and home inspectors for 20 years. In this interview, he provides insight and advice from the inside on rates, claims, disciplinary actions, coverage and more. Ryan: I frequently hear insurance professionals say that not all errors and omissions policies are created equally- that which insurance company/policy an appraiser chooses is important. Is this true? Brauner: There are a handful of agencies, including our own, that have served this profession for many years and that handle programs written specifically for appraisers. These agency names should be familiar to most. These programs have underwriters and counsel who are familiar with appraiser-related issues and have experience defending them. Some programs such as ours have “extras” too, like coverage for responding to state board complaints and “pre” claims advice/assistance. Most offer prior acts as well. Yes, it is important to make sure you know who you are dealing with and what you are getting. Ryan: You are always stressing “prior acts.” Why is coverage so important? Brauner: Most appraisers know by now that their policies are Claims Made, which means that the claim must be reported during the policy period. This means that coverage for appraisals in years past can be lost if the policy is allowed to lapse or is canceled. Switching companies is typically not a problem, as long as the transition is completed within the policy period, meaning before the policy expires, and the new company provides coverage for prior acts. Just imagine someone who unwisely switches to a company that does not provide prior acts. Now imagine it being you, having coverage when the appraisal in question was completed but not having it years later when the problem arises. Most appraisers realize that claims typically take at least a few years to surface, which is why back coverage is so important. Ryan: So it’s important that appraisers ask their agent whether they will be getting prior acts? Brauner: Yes, it is important to ask this question. Appraisers are being sued in record numbers today- even the careful ones, so you’ll want to keep coverage for past appraisals. You could be making a big mistake by letting the back coverage go. Ryan: What about complaints from state boards? Brauner: Unfortunately, we are seeing complaints that are ill-conceived, emotional responses to the dramatic loss in equity many homeowners are suffering. No matter the merit, appraisers have to spend time and resources defending themselves- even if they did nothing wrong. It’s not fair but that’s the way it is. This is why cancelling a policy midterm or willingly giving up your prior acts coverage to save a few dollars, even a few hundred dollars, can cost you should a problem arise from the past and there is no coverage. Ryan: Price is always front and center. Appraisers I speak with ask why their premiums have gone up year after year even though they have a clean record. Brauner: Premiums have risen over the last two-three years industry-wide due to an increase in claims. The volume of work created by the refinance boom and housing bubble, and the subsequent pain caused by its collapse, have caught appraisers in the middle. Claims against appraisers have skyrocketed as a result. The good news is that we are seeing signs that the worst is over. Claims are slowing down, premiums are leveling off but it’s been a rough couple of years. Ryan: What about appraisers with clean records? Brauner: We have seen minimum premiums rise industry wide in the last few years hurting even those with clean records. But if your record is clean, take comfort knowing that, at our company at least, you receive the minimum or the lowest premium possible from day one. Appraisers with clean records get the best rates. Ryan:What about getting coverage with a claim if you are dropped? Brauner: Many times you can obtain coverage from an alternate carrier if you are dropped. Don’t give up. Sometimes all it takes to obtain coverage is a fresh set of eyes, especially if the issue/claim is not too serious or costly. We advise clients to prepare their claim summaries and rebuttals for the best possible outcome: concisely, professionally and with inclusion of new procedures that might prevent the problem from happening again. Conversely, and I say this respectfully, handwritten scrawl, ranting, incoherence, blaming others for everything, even if it’s true, works less well in persuading an underwriter that you are a good risk. It pays to put time and attention into these responses. Ryan: What other advice do you have for the growing number of appraisers who find themselves with claims or disciplinary actions? Brauner: First, report the event to your agent/carrier when it happens for your own protection. To be covered, claims must be reported during the policy period with Claims Made policies as we’ve said. To my knowledge, every appraiser has a Claims Made E&O policy. If you fail to report a claim when it first arises, let your insurance policy lapse either intentionally or by forgetting to renew on time, and then try to obtain a defense from the carrier, you may very well be left without coverage, even if you were insured when you did the appraisal. But if you get a claim or dispute on the record during the policy period by reporting it to your agent, it should be covered down the road even if you have let your insurance lapse and the policy is no longer in force. Also, the terms of most insurance policies require you to report claims and incidences in a timely manner. This language allows a carrier to potentially refuse coverage if they feel the delay in reporting hurt the defense. It hardly ever happens but you don’t want to be the one exception. Ryan: So honesty is the best policy? Brauner: Always. You should always report any claim or disciplinary action on any and all insurance applications. It may seem counterintuitive to disclose something that is easier to hide and maddening if the incident or complaint is frivolous. But disclosing is for your own protection. And not only for making sure that there is coverage when you need it. You also don’t want to report having “no claims or incidences” on an application and then have a claim surface that you clearly knew about prior to submission of the application. Underwriters are the opposite of insurance agents- underwriters look for any reason possible not to write your business. If they think you failed to disclose something intentionally, they may refuse coverage for what they consider to be dishonesty. There is no “right” to insurance. If this happens, it makes it harder to get coverage elsewhere, as you might expect. Ryan: So appraisers should report claims and incidences for their own good? Brauner: Yes. Seeking professional assistance early also can diffuse an issue and make it go away. If you have a disciplinary action, we advise seeking the advice of counsel, which is covered in many cases. Ryan: Any other advice for appraisers with claims/incidences? Brauner: We advise our clients who have a claim or disciplinary action to submit their renewal information, including claims documentation, far in advance of expiration to allow time for quoting and shopping. It’s always good to have choices, especially if your livelihood depends on having coverage. Renewals with claims are more complicated and take longer to underwrite. Beginning the process early can relieve the stress of uncertainty as your policy expiration date approaches. Ryan: Renewing ahead of time is a good idea for business reasons as well, right? Brauner: Yes. AMCs/lenders have begun asking appraisers for updated insurance documents well in advance of their policy expiration date, sometimes 30 and even 60 days in advance. I take these calls every day from appraisers. Some report being cut off from work until the new documents are furnished even though the old documents are still current! New docs can usually be furnished in a day or so but no one wants to lose even one job these days. To avoid this scenario, we encourage our OREP insureds to renew early so they can have their docs ahead of time for their clients. I’m sure other agencies do the same. We also find that most lenders and AMCs require a minimum coverage limit of $1 million, so we advise purchasing this amount right off the bat rather than not having the coverage when you need it and possibly losing work. Ryan: What other insurance advice do you have? Brauner: I’ll answer with some health advice I once heard a doctor offer about living longer: he said don’t smoke and wear your seat belt. I think he was saying that we know two things that will shorten your life for sure, so avoiding them is one way to live longer. In the same spirit, the best advice I can offer about insurance is to make sure you have it when you need it. That is the bottom line. If you do have insurance, renew before the policy expiration date to ensure continuous coverage for all past appraisals. We contact our insureds through mailings, e-mailings and phone calls as expiration approaches to make sure that if they aren’t renewing, it’s intentional. This is one issue we put a lot of effort into. If you’re retiring, consider Extended Reporting Period or “tail” coverage so you can sleep at night. This covers all your old appraisals into the future. Ryan: And if you don’t have insurance? Brauner: If you don’t have insurance, consider getting it because even good appraisers get sued. Consider this: as expensive as E&O seems these days, the most recent “average cost of defending a claim” that I have seen is $25,000. If you have to defend yourself out of pocket, that is two-three decades’ worth of premium for most appraisers. Ryan: Finally, 2011 marks the 10 year anniversary for David Brauner Insurance Services/OREP.org and Working RE Magazine. Congratulations! Is there anything exciting to report? Ryan: Anything else as we close? Brauner: It’s hard to believe how quickly time flies. 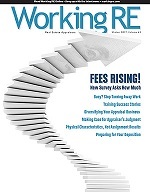 I’ve been providing E&O to appraisers and covering issues important to this profession through Working RE and the Communicator magazine before that for 20 years- most of my professional life. I’m about the same age as the average appraiser today, 53, and I think I probably have a pretty similar outlook and ethic. I just prefer to say what I mean and mean what I say. I prefer dealing with those who do likewise and I think many appraisers are the same. Ryan: Any last thoughts about ten years of business? Brauner: To me, it’s quite evident whether someone values my business or not by how and even whether they answer the phone- if they can help me when I need it instead of when it’s convenient for them. There is nothing more frustrating than having a problem I want off my plate and not being able to speak to a person who can help. I’m sure they care about cashing my check but do they care about solving my problem? That’s why we answer the phone, so no one spends time playing phone tag instead making money or enjoying friends and family. Our Mission is Business by the Golden Rule, which means treating everyone the way we want to be treated; with honesty, efficiency and courtesy. I’d like to thank everyone who has entrusted their insurance to us over the years.